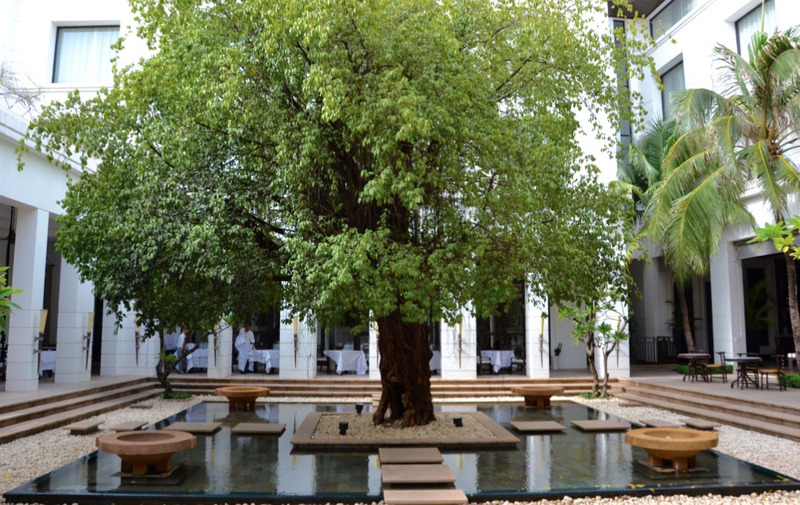 Sitting on the swing seat in the shade of the cloistered courtyard sipping my mojito, I gaze at the most perfect Banyan tree which is the centrepiece of this elegant oasis of sophistication amid the hustle and bustle of downtown Siem Reap. Small birds hop to and fro pecking for ants around the pool. A small woman in dark green uniform and broad brimmed hat slowly sweeps away the few fallen leaves from last night. I’ve been here since breakfast and it’s now just after noon. The atmosphere is perfect and I don’t want this moment to end. It was a good breakfast. Mr Pisith cooks excellent traditional Cambodian food, following his grandmother’s recipes. His father before him was also a chef at this hotel. 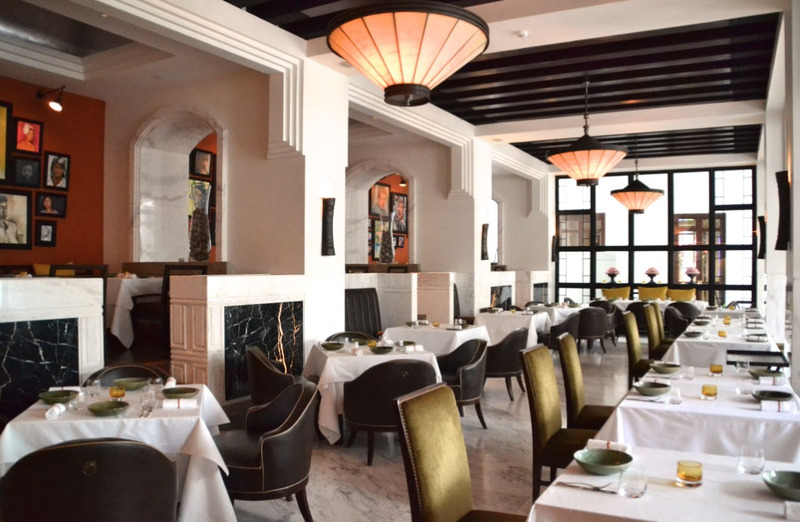 Mr Pisith, Cambodian noodle soup and the banyan tree, all perennial. All timeless. If only I could stay forever. I have fallen in love with this hotel to the extent that I fantasise about having my ashes spread under the banyan tree at the full moon. To become part of this place, this serenity, what better ending could there be? I am shaken from my daydreaming by my wife who reminds me that we have an appointment at the spa in half an hour. Such hardship. I shall have to trudge inside and walk through the vast glass double doors which will once again be held open for me by their twin attendants who appear from nowhere to prevent me having to strain a sinew. I shall have to take the elevator, scented with a bowl of fresh jasmine flowers, up a floor. 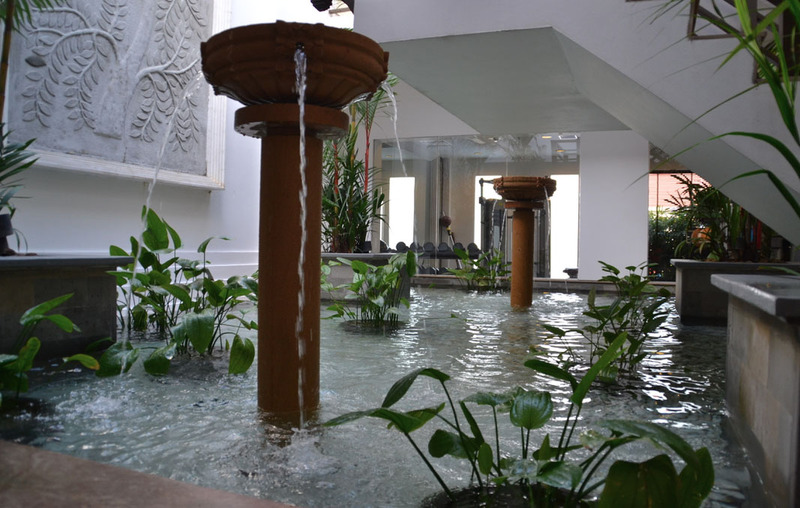 I will have to walk through the cool corridors and over the terracotta tiled bridge past the magically tropical freeform pool to the spa reception. 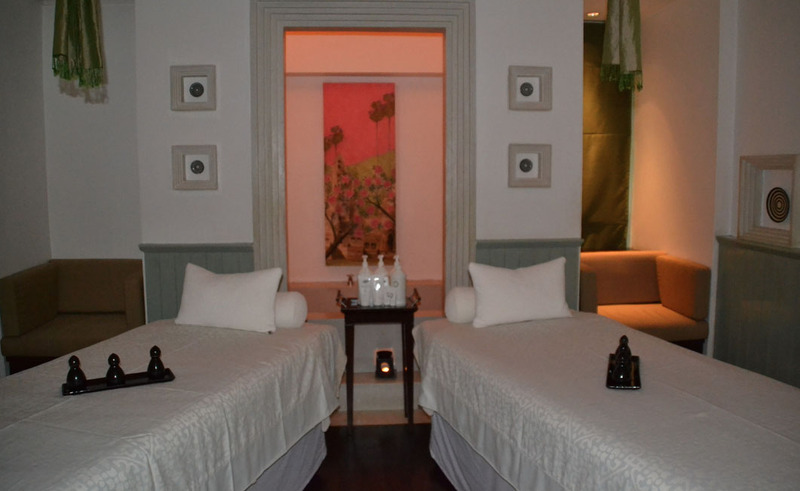 I will be forced to drink chilled lemongrass tea, mount the stairs through the secret garden to the therapy suite and allow yet another Cambodian masseuse to work on my knotted muscles with her super sensitive hands for a whole hour. Such hardship can barely be born. Just before we depart, the general manager happens by. A giant of a man with the gentlest manner, Sholto Smith must be something of a god to the tiny Camodian staff. “How are things?” he asks and is there anything he can do? My response is that everything is just fine and he’d better not change anything. He’ll go on trying to improve the level of personal service, that’s how he works but the smiles and warmth of the Cambodians are so genuine and spontaneous that to improve their English skills would almost spoil the otherworldliness of the place. If you’re a European or North American, Siem Reap is definitely otherworldly. Most people who come here do so for one purpose. To visit the largest religious site ever constructed by mankind. Just 15 minutes from the hotel by motorcycle tuk-tuk, Angkor was in the 11th century the world’s largest city. One in a thousand of all human beings alive lived here then. It was the capital of a mighty kingdom unknown to the western world until French archeologist Mouhot started to map it and cut back the forests which had overgrown its beautiful temples.Over a thousand temples have since been identified. 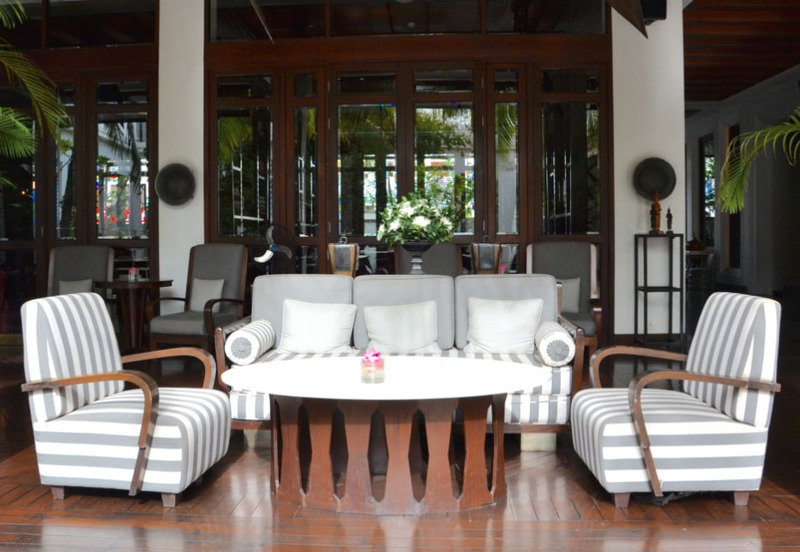 There is much much more to Siem Reap than temples though. Wonderful restaurants, the most amazing, intimate circus troupe, vibrant markets and even a crazy golf course. If you want to get to know this crazy, hurly-burly town with the big smile but have a quiet, luxurious hotel to retreat to, you couldn’t do better than the Park Hyatt. Slap bang in the middle of town, walking distance from everything including the famous (infamous?) Pub Street but hidden within plain white walls concealing a haven of tranquility and elegance. There is even a bakery shop, open to the public selling french style bread with a sing-song musical crust. 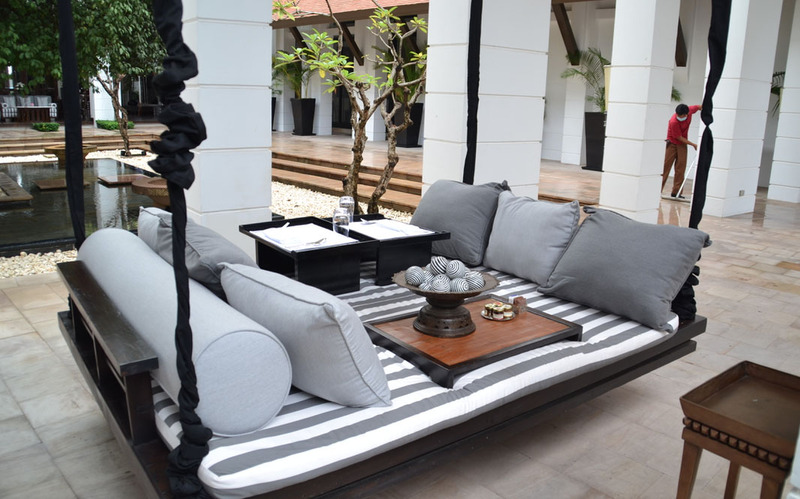 The smallest room is 35 sqm and beautifully furnished in a modern take on Khmer style. 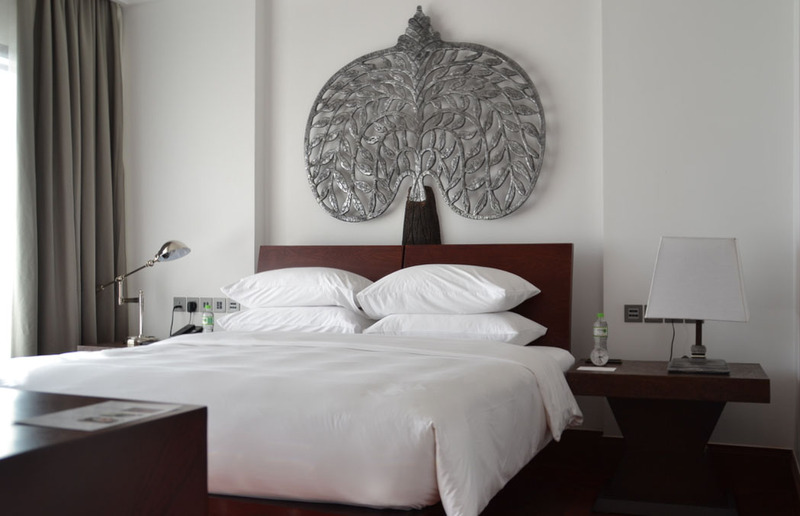 All rooms are very well appointed with Nespresso machines, effective aircon, marble bathrooms, wi-fi large screen TV and everything else that spells luxury. View rooms have a view of the courtyard and are quieter than the outward facing rooms. Suites range from the 71sqm Park Suite King to the Presidential Suite. Our favourite though is the Park Executive Suite – there are only four and one of them has two bedrooms. 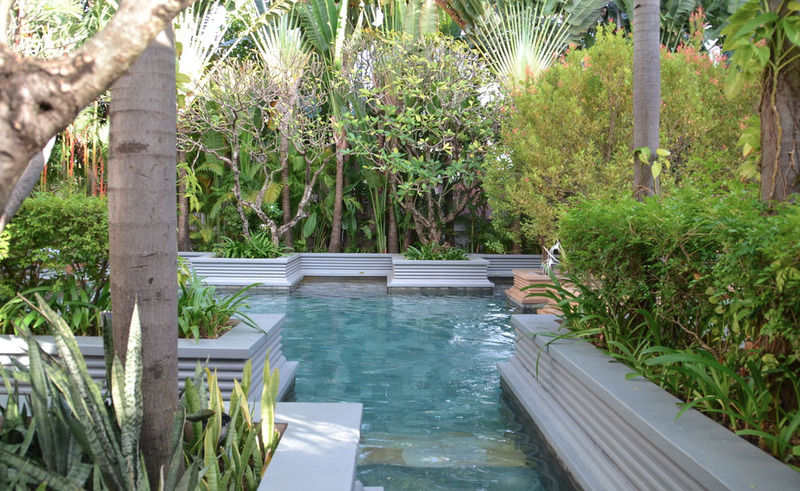 Each has its own courtyard and private plunge pool, which is exactly what you need when you have survived the humidity at the temples. There is just one restaurant for the 104 guest rooms but it is a very good one and three course dinner can be as little as $25pp. There are always special offers on wine (including Champagne) and dinner is accompanied by a very tasteful display of traditional Khmer dance and music three times per week. 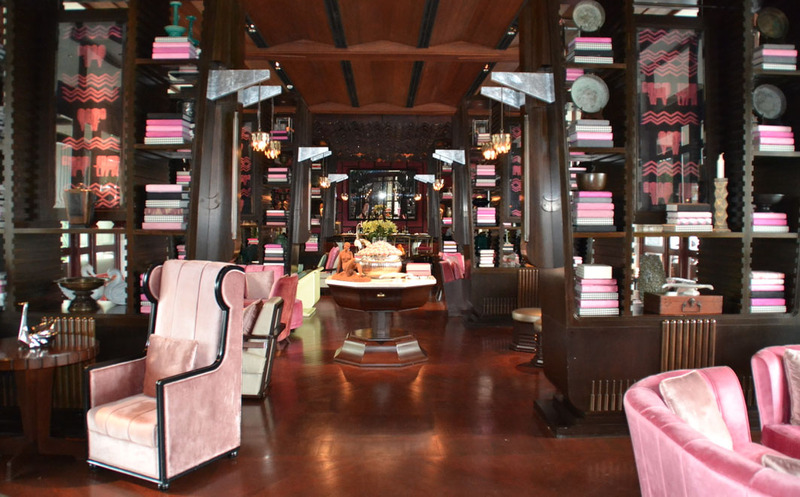 The lounge is a beautiful and cool place for cocktails or meetings and the hotel shop displays some truly fantastic Khmer artworks to admire or purchase. They support a local art charity too. This hotel is so good we have twice cancelled other plans to come back here and we will keep coming back for many years.